Did I ever mention how much I love raw desserts? Raw desserts are great, not only for their added nutritional benefit, but for the ease in preparation and the no cooking factor. Plus, it is very hard to find unhealthy raw desserts simply because to eat something raw, it must not be heated during processing. Thus more often than not raw desserts will include just nuts, seeds, fruit and other super foods. If I do not have time to prepare sweet treats I often end up making raw energy bars by quickly throwing a few things in the food processor. Typical ingredients include dates, seeds, coconut, nuts, dried fruits and cacao. Most of the time no measuring is required as you can tell if the bars will hold or not by the consistency of the mixture . 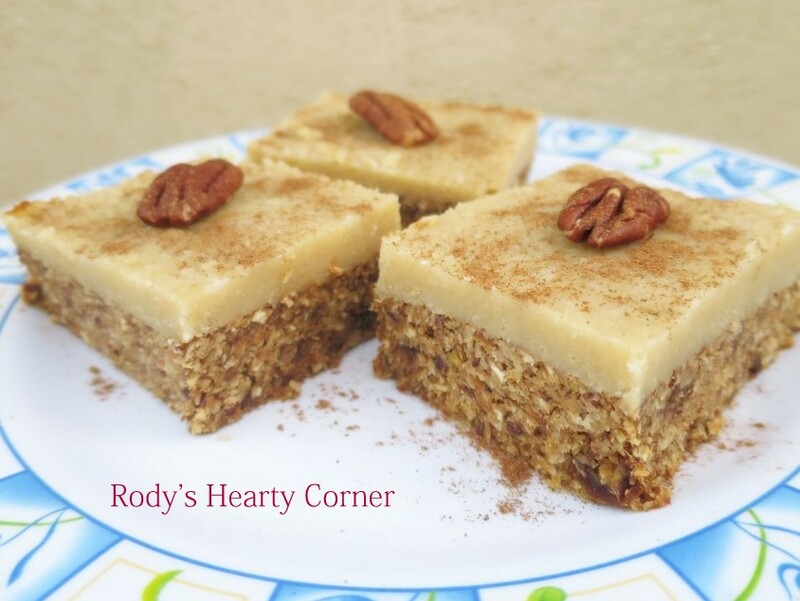 If it’s too moist add more dry ingredients, if too dry add some nut milk, water, honey or more soaked dates. Check out my recent raw bar recipe on Facebook. 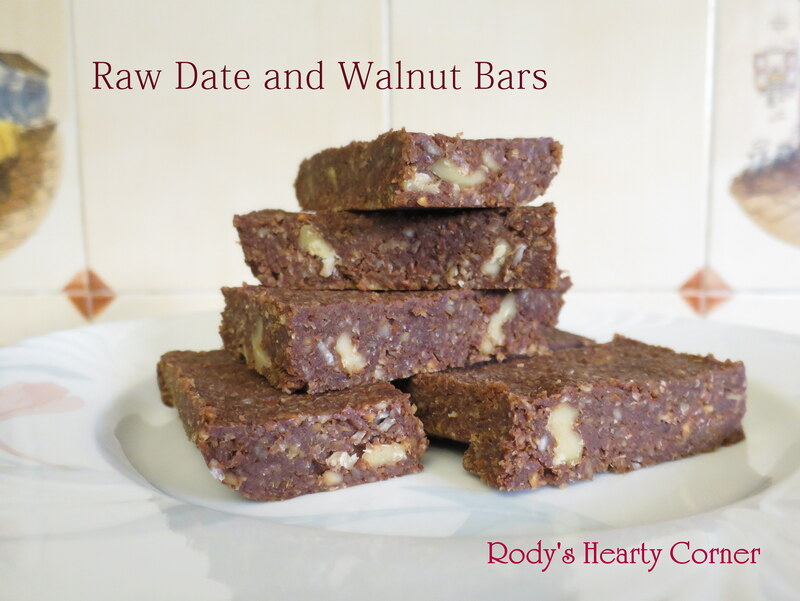 A preview of these Raw Date & Walnut bars can also be seen below. Since I usually end up having similarly tasting raw bars, I tried to be more creative this time. It is my first time using carrots in a raw dessert and I am very happy with the outcome. 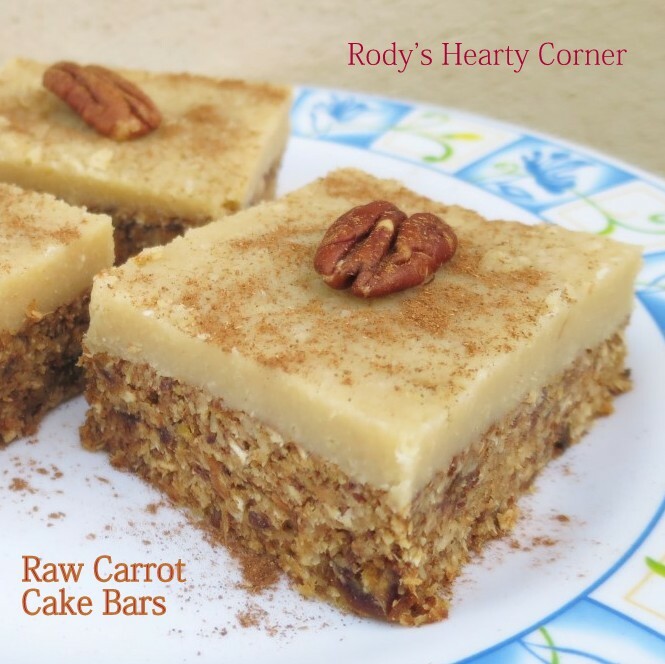 This raw cake / bars are so much simpler than the equally delicious baked healthy carrot cake. So here is the recipe. You can shape it in a round pan for a raw cake, or in a square dish for bars. Remember to store raw desserts inside the fridge. Start by pre-soaking the cashew nuts for at least two hours. Soak the dates in hot water for around 20 minutes (time is approximate as you just want them to soften). Blend the oats in a food processor. When powdered add the remaining bottom layer ingredients except for the coconut oil and coconut milk, then mix well. Gradually add the coconut oil then the coconut milk until the mixture looks like its holding well together. Grease the prepared pan with some coconut oil. Using the back of a spoon press the mixture into the bottom of the pan forming an even layer. chill in the fridge until ready for topping. Prepare the frosting by blending the frosting ingredients together in the food processor until smooth. This should turn into a creamy paste. Layer the frosting on top of the base and flatten using a spatula or the back of a clean spoon. You can optionally top with some cinnamon and pecan nuts or walnuts. Store in the refrigerator for at least two hours before serving and cutting into bars. Please take note that some preparation for soaking the dates and cashew nuts is required for this recipe. Tried this recipe with out the frosting as i could not find coconut cream and all i can say is that the results were excellent =). Really like the idea of not having to use an oven or eggs and still have a great taste! . I’m glad you like it Yanica :) Although the creamed coconut does give a sweater taste, I’t not a huge amount thus you could replace with 30g coconut oil. The oil will harden in the fridge. Otherwise you could use some coconut yogurt or other yogurt of your choice instead. This will give a softer frosting.